Lily Can’t Sleep: setting the baa high. In 2006 Bridget Boyle and Liz Skitch from Debase asked me to be part of the team putting together a new show, a two-hander, for the Out of the Box Festival at the Queensland Performing Arts Centre, which they were commissioned to write for the Queensland Theatre Company. 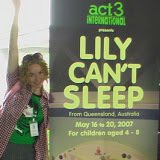 They had a title: ‘Lily Can’t Sleep’, a premise, characters and a loose, though open-ended storyline. They initially asked me to be a dramaturg for the project, and that was good work, bringing both research and a new creative perspective to the emerging play. I helped them clarify their premise – that the lives of Lily and her tired mother were in a state of disturbance, in the middle of moving into a new home, with the prospect of the first day at a new school tomorrow. At bedtime, these stresses play out, and are ‘played’ out (playfully) when Lily takes her mother’s dismissive advice to ‘count sheep’ literally. A nutty sheep called Baarbara appears in Lily’s room, and it goes from there. Classic stuff. As my engagement in the process deepened, we agreed that I’d come on as a co-writer, making artistic contributions, co-creating rather than just advising. Bridget and Liz were hugely playful on the rehearsal room floor, indefatigably rattling at new ideas with their comic smarts. I was better on the page, and by that stage was fairly adept at applying research into child development and other issues to emerging dramatic action in ways that added depth rather than made it more didactic. The initial premise was focused on ‘coping’ with spirit and humour; it needed to spend more time exploring and unpacking the issues of childhood stress bound up in the play concept, so a lot of my work as a co-writer was in the first act. There wasn’t much music at all in the piece, and the script was focused on the spoken word and physical jokes, so moments when music arrived had an extra-special significance. In this piece I’ll magnify (or rather amplify) the way music was written into the show, and gathered significance as the show moved towards production and performance. I’ll raise the ear-trumpet to one particular sequence in the show. It might get a bit detailed, but here goes. MUM: Lily if you feel sick then go to sleep and you’ll feel better. I’ll put your music on and you can relax!!!! MUM puts on relaxation music then storms out. LILY lies in bed, relaxing music plays. LILY: Mum! That’s not my music! LILY lies back in bed, pulls up sheet and tosses and turns. LILY tosses and turns, doing sleeping position lazzi (many different positions, ending up quite ridiculous). The moon in the window rises. Within this fiction we can infer that music’s a habitual part of the bedtime routine, and that the mother has used sound (music we recognize as New-Age/Ambient) to stabilize the environment for her discombobulated daughter. Or is at least hoping it’ll pacify her. So the idea of music means different things to each of the characters. But Lily tells us that it’s ‘…not her music’. So it’s not going to help her sleep, or relax her. As a tool, it’s not going to work for either of them. The mother exits, and the music starts to mysteriously ‘misbehave’. 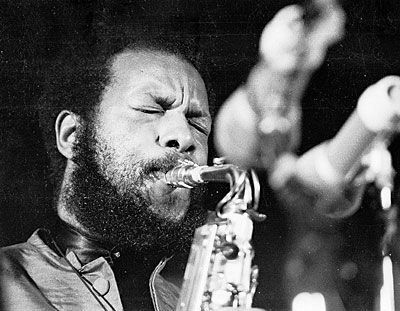 Here, the writer (who’s me, in this instance) has suggested Ornette Coleman, a proponent of free jazz. So there’s a radical contrast embedded in the way the music’s described in the text. I can’t demand the production use this music, there are other factors at play here such as the ability of the company to secure the dramatic context rights to it, but I can suggest it. You’ll see in the video the actor was directed to physically adjust the sound source – to ‘fix’ the music, which I think was a directorial mistake, but that’s not my department. Suddenly the music changes to an up-tempo, busy jazz number, [Ornette Coleman] Lily sits up to fix the stereo and the music changes back to the relaxing drone of the new age weft – seemingly of its own accord. The music changes again. Jazz. LILY sits up and the music calms again. This is weird. LILY slowly returns to her bed. She rapidly sits up, to ‘catch the stereo out’, but it remains unchanged. She lies back down again. 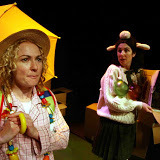 The music, and the associated routine has also provided time for Bridget, who’s playing the Mother, to change costume and transform into a sheep, who emerges from Lily’s toy-box. We’ve seen a plush toy sheep chucked into the box earlier. So music also performs its common theatrical usage here: a tool to cover a transition. The sheep (Baarbara) appears (as sound first:‘Baaa’, implying the plush toy has ‘come alive’), we come to see that she seems to be playful, chaotic and unbridled as the music that heralded her appearance. The music has set the baaa high. Maybe Liliy’s imagining her. Maybe she’s real. Maybe she’s both: Lily’s preferred version of her mother – not tired and dismissive, but energetic and playful. It’s better to leave these things unresolved. Baarbara goes on to play with the sonic environment, over which she exerts some control, she can summon up foley sound effects at will, and has a keen interest in unaccompanied showtunes. This ‘go to sleep’ bit is a rather extended sequence that the children really enjoyed. It luxuriates in the transition between realities rather than cutting to the chase. At the outset, perhaps you hear, in the video that ‘forced laughter’ that children sometimes offer at first when they see a play that they’re expected to enjoy. Being used to fulfilling adult expectations, they push out laughter to reassure us that they’re ‘having a good time’ – but there’s something else going on too: they’re sensing their collective power as an audience, and using sound to play with that power. 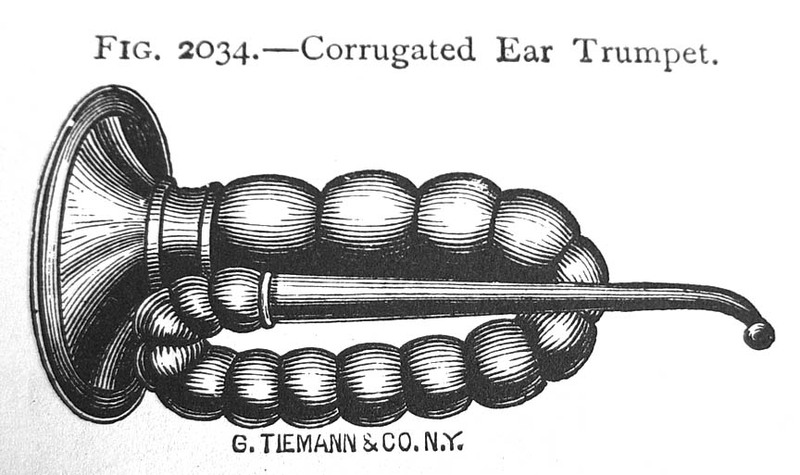 It’s a bit weird, this phenomena (a bit ‘children of the corn’!) but you get used to it, and you can hear the transformation as the child audience begins to engage and react more naturally, and genuinely enjoy the show. The ambient ‘go to sleep’ music returned after Baarbara’s departure, bookending the alternative reality. This show is quite lovely – by shear coincidence it’s on once again at the Brisbane Festival 2013 – if ewe have kids aged 3-8 must be sure to catch it live!